Just as the season begins to change, the weather becomes this perfect temperate balance between the lingering winter chill and upcoming summer heat. It is a refreshing time of year where you feel like you can shed the layers (both physically and metaphorically). I had been feeling really overwhelmed, literally like one limb was being pulled in each different direction and I was finding it hard to get the balance right. Trying my hardest to finish all my existing (editing) work, be a good friend, keep up with running my business and the administration and making time for mind, body and soul. And then, just like that, I found myself on top of a mountain breathing in the clean air and admiring a vista carved millennia before me and everything else in that moment began to fade away. They say it’s always darkest before dawn, and that is true of the mind - darkness until something gives and you see the light. Australia is grand and I love that within a two hour flight and three hour drive I can find myself standing on top of a mountain with my work friends as the sun goes down. I’ve worked with Matt and Rob on multiple Tourism campaigns over the years and it is always nice to see familiar faces and to explore with like-minded, hard-working and extremely creative individuals. We shared a week on the road together, exploring the best of two of Victoria’s well-loved National Parks. Our first stop on the Spring road trip was the ever-impressive Grampians National Park, or Gariwerd, as it is known by the Traditional Owners. 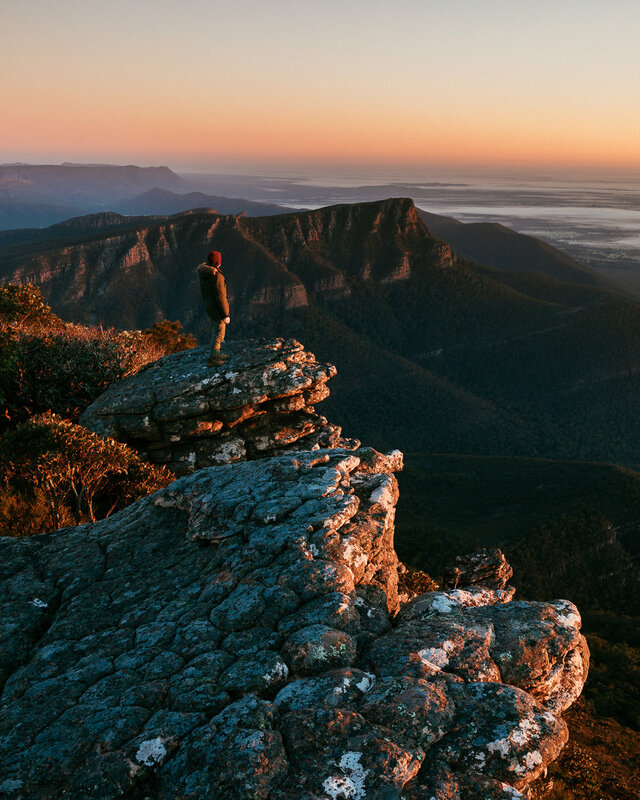 The Grampians are a series of rugged sandstone mountain ranges and forests which rises abruptly from the surrounding western ranges and with a plethora of hikes (for all levels), waterfalls and easy to access lookouts, it’s not hard to see why it a favourite weekend escape. Although trust me, with so much to see you will want more than just a few days. Our first afternoon spent staring at the breathtaking view from The Balconies, of Victoria Valley from Victoria Range, Serra Range, Lake Wartook and the Mt Difficult Range. Perhaps this is one of the best things about travelling, the chance to get out of your own mind and into nature – to be humbled by the wide open spaces, to refresh and reset. One our first morning weedor rose quite early to arrive at the lookout at Mt William before sunrise and although it was cold, it was absolutely worth it once the day began to break – it always is. 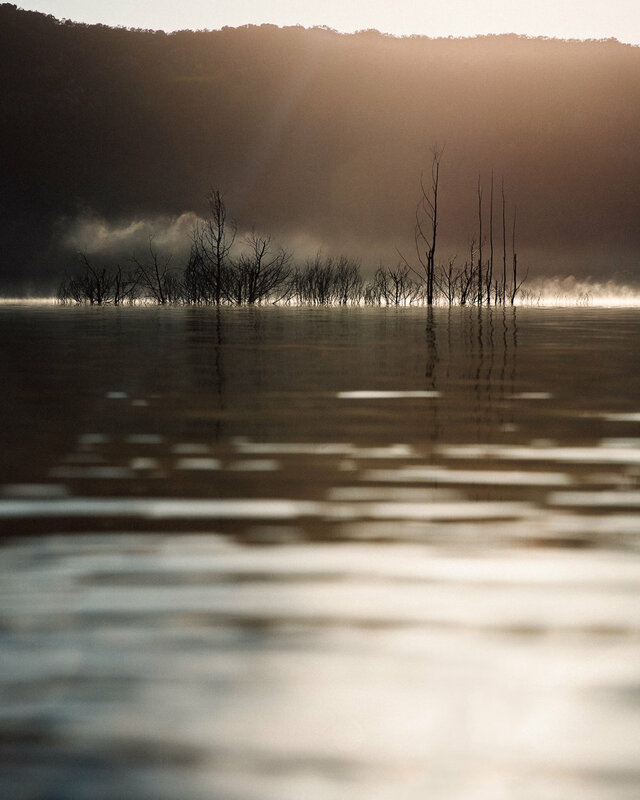 Feeling extremely contemplative and letting myself slow, I was drawn to the misty morning scenes. 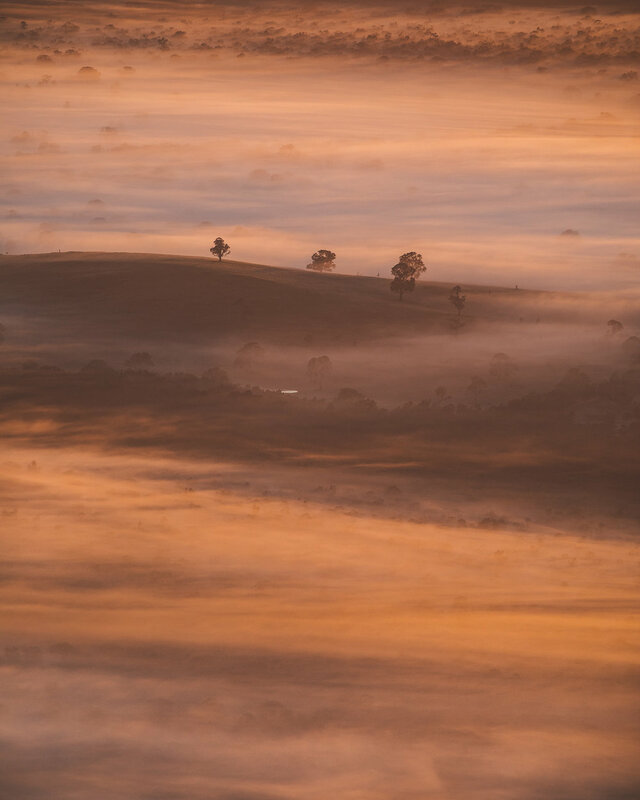 Mt William is easily accessed by road and short (but steep) 2km hike to the top, we were greeted with rolling hinterland views shrouded with fog in the valley below, as the first light of the day turned the granite a shade of red briefly before warming our bones. To feel small here; we played like little kids running around on the huge rocks, admiring the rugged plant life and finally coming to a still and sitting to inhale the beauty before us. Breakfast, breakfast and lunch actually, every day became a thing at Livefast cafe. Why? Because they literally had some of the best menu options that two vegans had seen and Matt and I were super impressed (Rob all too happy to oblige). As each night ended by the fire place of our little cabin, each day begun quite similar – we would shoot sunrise and then retire to Livefast café to make our plan for the rest of the day. 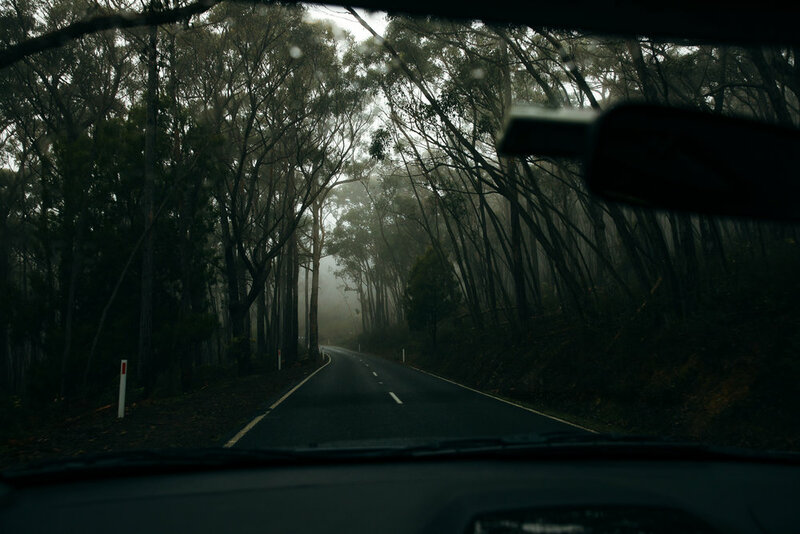 With so many options and little time it was hard to decide on which places we wanted to explore and all of which became determined by the weather. 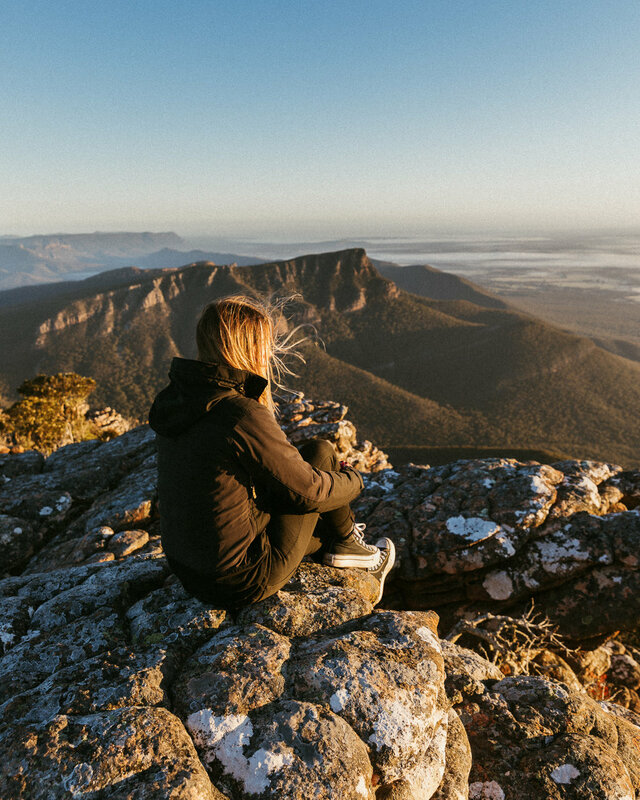 We visited the popular Boroka Lookout, only 10 minutes walk from where you park your car, and strolled through the open Stringybark forest arriving at the lookout with a spectacular view of the Wonderland Range, Lake Bellfield and the plains across the east. Mackenzie Falls is another popular highlight of any trip to the Grampians and it is the view that awaits you at the end of this steep trail (2km return) that makes every step feel worthy. A waterfall that is flowing all year, the water cascades over huge cliffs into the deep pool below and is often (on sunnier days) spraying a fine sprat of rainbow mist into the air above the stunning gorge. 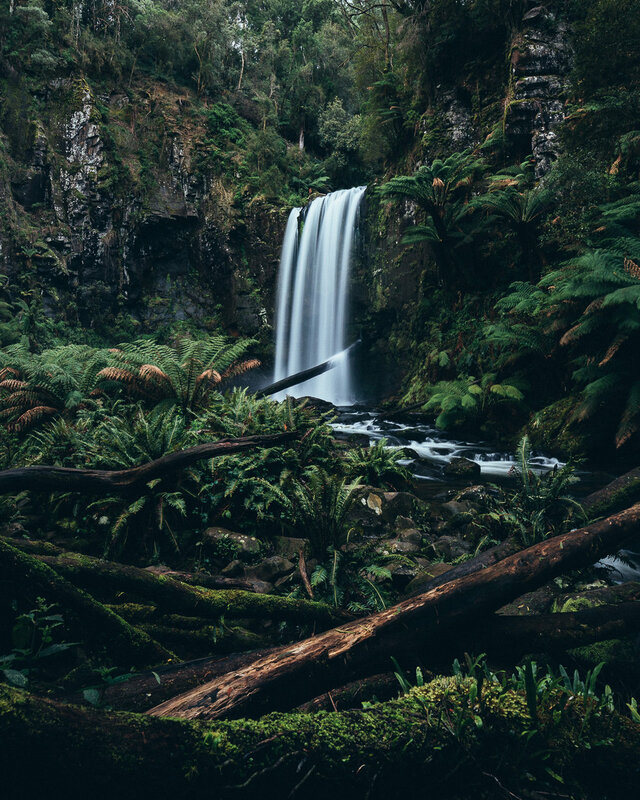 Take your time visiting here, this unique waterfall with its striking contrasts, is one of my favourites in Victoria. Of one of the evenings we found ourselves out at Hollow Mountain. A grade 3 track which is most suitable for fit and energetic walkers, as it can involve slippery track surfaces, rock hopping and scrambling - but when you arrive to the summit you are greeted with stunning views over the Mt Staplyton Amphitheatre and the Wimmera Plains. It’s all a part of the adventure of travelling to get a little lost, take a wrong turn and wind up in the right place at the right time and that is exactly what happened on this particular evening. We saw blue hour out here and watched as the sky opened up to the plains before us for a spectacular sunset storm, clearing in time for us to get creative with a lantern and showcase the epic rock formations of Hollow Mountain Caves. The next place on our agenda was the world famous Great Ocean Road. 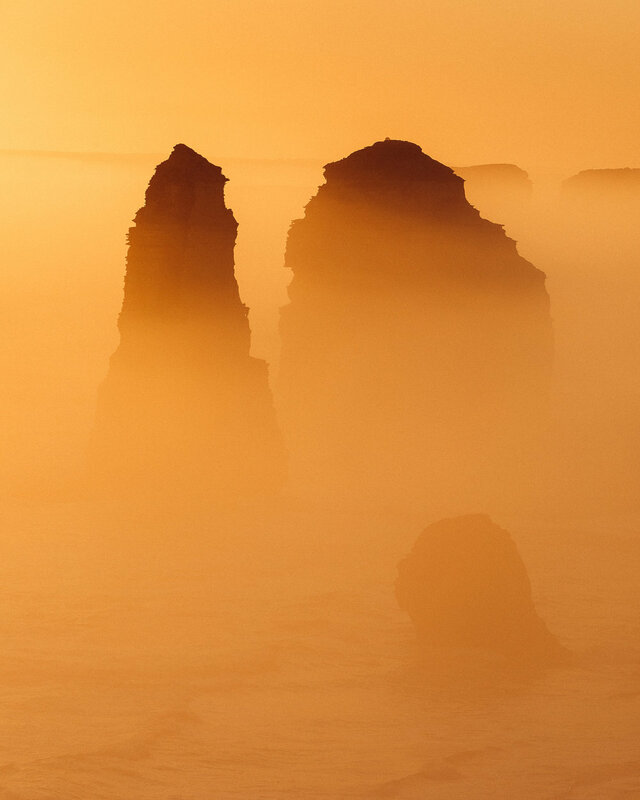 Our journey south began leaving the Grampians with a 3.5-hour drive arriving at the iconic golden cliffs of the Twelve Apostles Marine National Park. The Twelve Apostles Marine National Park covers 7500ha and runs for 17km along one of the world’s most stunning coastlines. Mother nature is dramatic here, you can stand and watch the wild power of the waves of the Southern Ocean as they pound the coastline and continue to shape the area into what it is today. 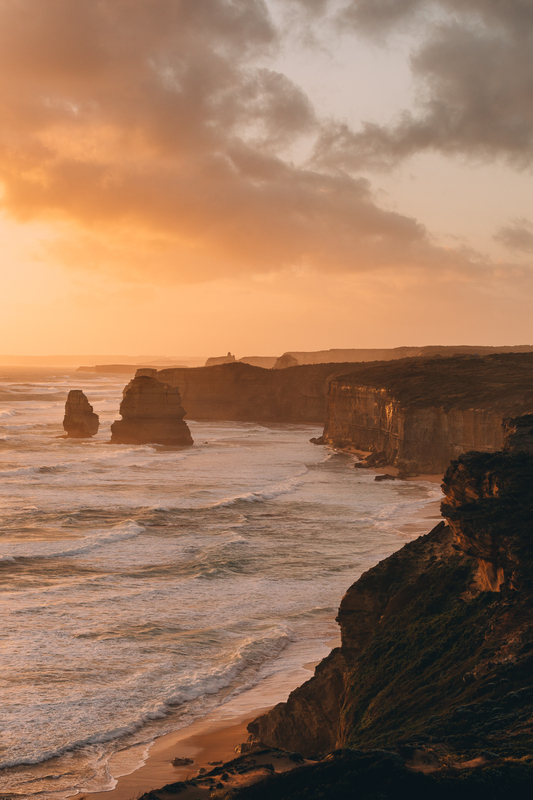 We visited the stunning Loch Ard Gorge, London Arch, and Gibson Steps before settling in for one of the best sunsets I have ever seen in my life from the 12 Apostles. A combination of lingering sea mist and the setting sun made for an afternoon I will remember for many, many years. As I looked at the tourists around me there was a very evident common theme of awe, as we were collectively overwhelmed with the magic of Mother Nature unfolding that afternoon. 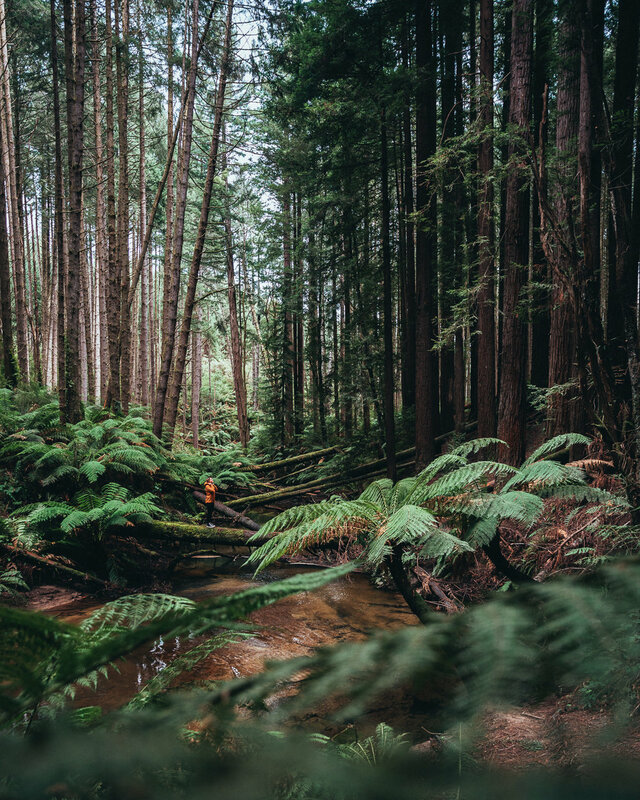 Staying in Apollo Bay meant that we were quite central and able to access many of the incredible locations nestled in the ancient forests running along this region. 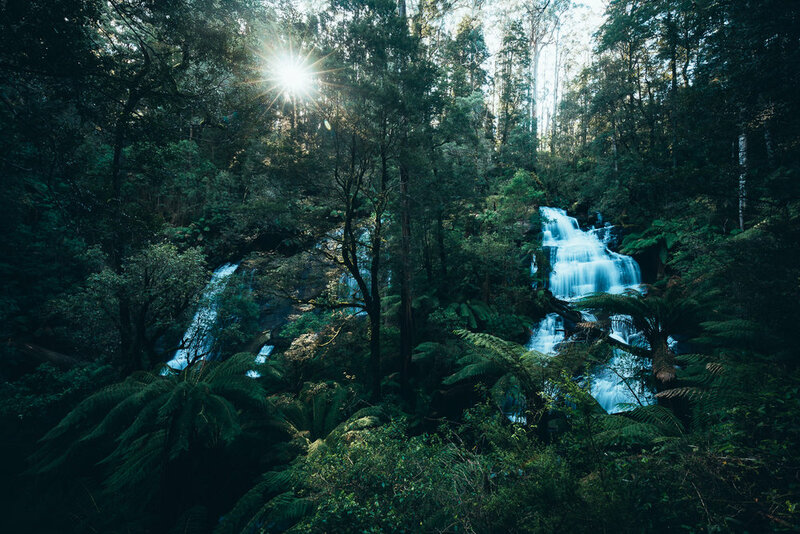 With its diverse terrain the Great Ocean Road is a sanctuary for natural waterfalls. We discovered the impressive cascades of Triplet Falls (2km/ 1 hr loop) and felt positively charged from time well spent at base of Hopetoun Falls (steep 1km round trip) and Beauchamp Falls (4km return) in The Great Otway National Park. Also exploring the nearby 85-year- old plantation of California Redwoods and watching the light filter through the clouds occasionally and beautifully illuminating everything below. Any visit to The Great Ocean Road wouldn’t be complete without a trip to Cape Otway Lighthouse, where we spent a starry a starry night photographing the oldest surviving lighthouse on mainland Australia. 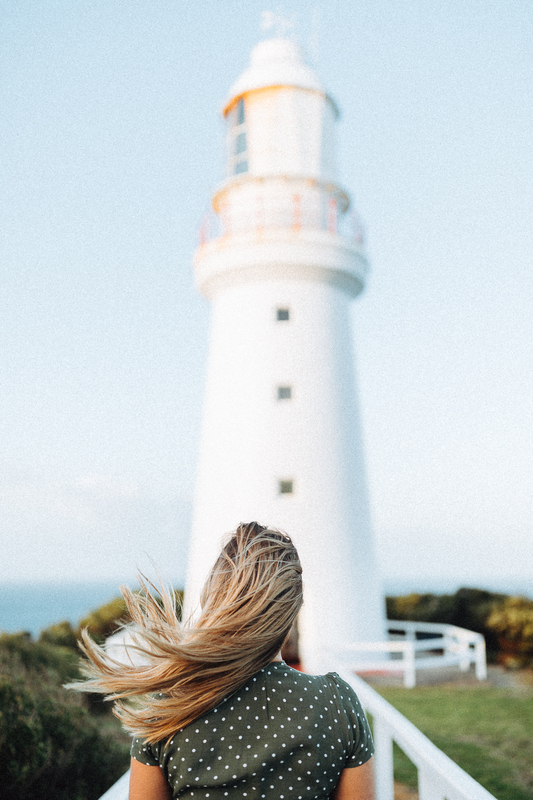 Built in 1848, the Cape Otway lighthouse known as the “Beacon of Hope” and this location is full of amazing views and amazing history – definitely worth a visit. We week in Victoria Parks – plenty of mountains and time spent by the sea, a lot beautiful native animal sightings, the freshest of spring air and moody weather (secretly my favourite) with glimpses of incredible light in-between, hours on the road, every waterfall explored and hearts left feeling very full. Reconnecting with nature and what is truly important; the reminder that even through the clouds, there is always light. Stay Curious, keep breathing and keep exploring. Thank you for having me VIC PARKS & Visit Melbourne. *NB: if you are visiting these regions (or any National Park) please TREAD LIGHTLY. All of these images were created in safe areas and without jumping any fences or harming the precious environment. Preserving it for future generations.